Golf is an outdoor sport that faces several issues when it comes to weather conditions. Something as insignificant as a little rain can also cause some major disturbance to your game. That is why golf umbrellas are an accessory that every golfer must possess to protect their clubs and themselves from a rough climate. But what is a golf umbrella? 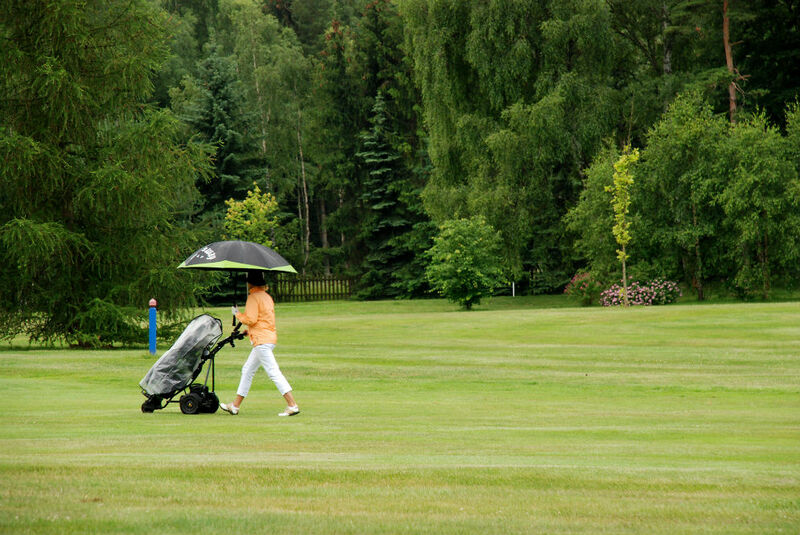 When the weather goes south, and a golfer needs a peaceful, safe, and dry golf course to play on, a golf umbrella will become the best accessory for protection. We are certain some folks are confused as what a golf umbrella is. In fact, they even wonder whether it is the same thing as a regular umbrella or not. Hence, we decided to shed some light on this subject so that you are better prepared for your next game. Golf umbrellas are specifically designed for golfers who play at the golf course in order to protect themselves as well as their clubs and bags from the bad weather. When we talk about golf umbrella sizes, we often refer to the length of the rib and the canopy size. For most golf umbrellas, this can be between 26 inches and 34 inches and the canopy will be up to 70 inches in diameter. This size is big enough to protect the golfers. Golf umbrellas typically have premium quality features to withstand harsh weathers. 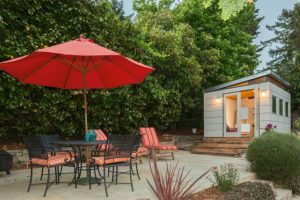 Their frame is made from strong fiberglass, and the canopy is made from waterproof materials such as 190T Pongee, 210T Pongee, or even 240T Pongee fabric. These premium materials along with their superior design ensure that the umbrellas don’t break easily. One of the significant and obvious differences between the golf umbrella and a regular umbrella is the size. It goes without saying that a golf umbrella is significantly larger and it has to withstand harsh weathers. Even regarding quality, the regular umbrella is flimsy and tends to break easily. 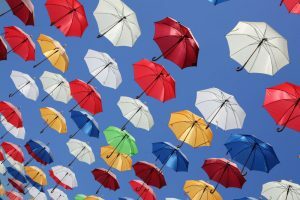 How to Choose the Best Golf Umbrella? One of the main aspects of a golf umbrella is its size. 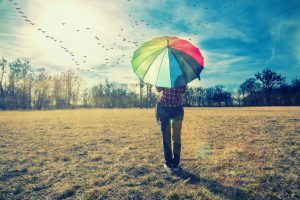 The size of the umbrella will help keep out everything–the rain, the harsh winds, and the sunlight. As a general rule of thumb, always look out for bigger umbrellas, as in this case, the bigger, the better. But not every golfer has the luxury to own a caddy. That is why you will need to buy a golf umbrella that is big enough but light in weight to keep all your clubs and the equipment dry while you are busy taking the shots. You will find several different styles and colors for golf umbrellas. So, choose one that is the most aesthetically pleasing to you and that suits your set. It is important to note that the weight and size of the golf umbrellas must be lighter and larger as it possibly can. 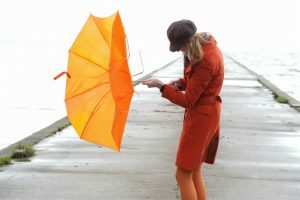 It is crucial to have a lightweight umbrella as you will have to carry it around constantly. In addition to being lightweight, an umbrella must also be portable. 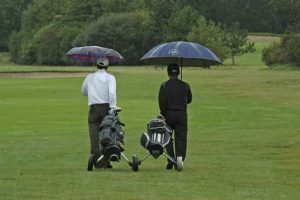 When you are carrying the golf umbrellas to see whether it is comfortable enough for you to carry or not, make sure that they are also sturdy enough so that it can withstand harsh weathers. Size-wise, the diameter of a golf umbrella can range anywhere between 30 inches and 70 inches. There are some umbrellas that are bigger than 70 inches, but they are quite rare. The diameter is an important aspect that you should pay close attention to since it is a protection gear–it must cover as much as it can to keep you safe. We believe that anything between the range of 60 inches and 65 inches is an ideal choice. This size can comfortably cover most of the area, while not being too heavy. You have to ensure that the golf umbrella is only made from premium quality materials. 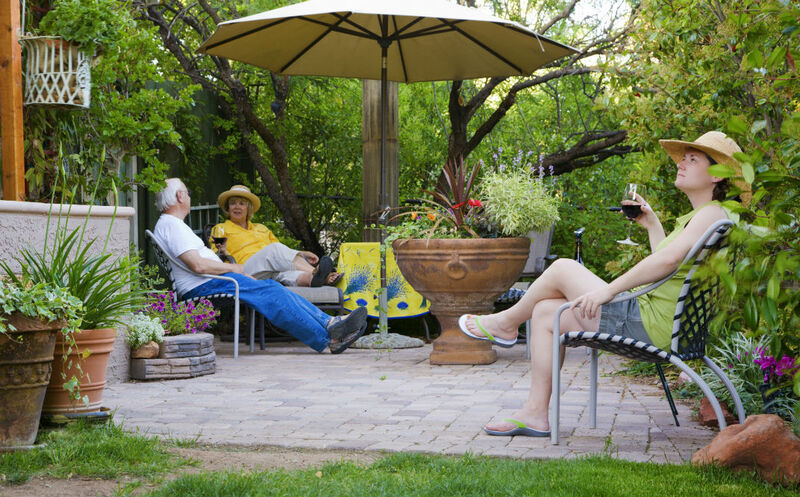 There are some factors through which you will be able to determine what the quality of the umbrella is. As mentioned earlier, the shaft and ribs of a good golf umbrella have to be made up of premium fiberglass. 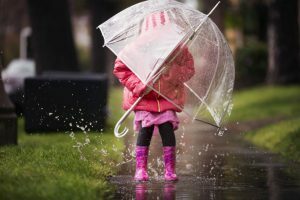 This is what gives the umbrella protection from all elements. Fiberglass is a fantastic material. It is quite light in weight and provides ample protection from harsh weather conditions. Likewise, it can protect you from lightning strikes. 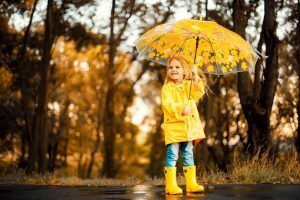 The nylon which is used in the upper portion of the umbrella must also be well treated so that it has waterproof properties. Umbrellas that have double canopies are capable of providing air vents which will allow it to resist heavy winds. All of the materials used to make a golf umbrella have a direct impact on its durability, quality, and functionality. 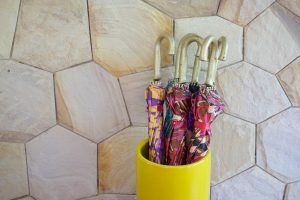 It goes without saying that the stronger the materials, the better functioning and long-lasting golf umbrella you get. Playing golf in windy conditions is challenging. Using a cheaper golf umbrella in harsh winds will make it fly away or invert, which will render it entirely useless. A good golf umbrella is made in a manner that it can withstand even severe winds. During their manufacturing process, they are tested against hurricane-type winds. Obviously, you won’t be playing golf when there is a hurricane outside, but it is good to know that your golf umbrella can survive something like that. 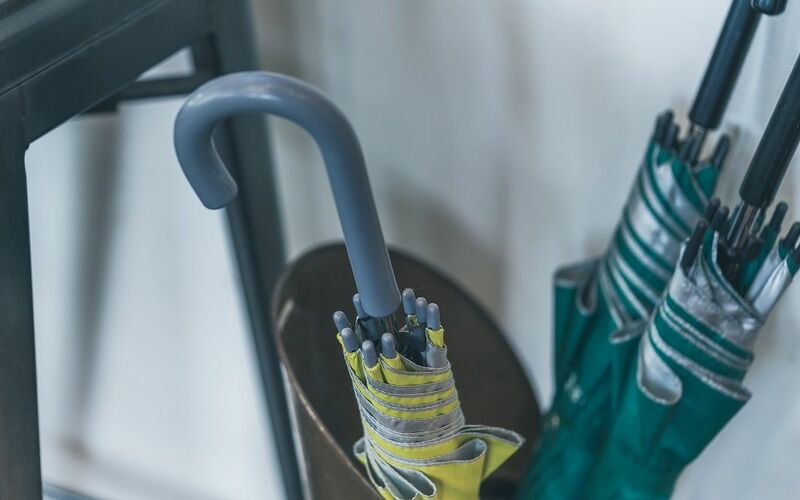 To overcome such harsh winds, many golf umbrella manufactures have now begun to incorporate several strong elements which will prevent it from inverting or flying away. One of the ways they do that is by making sloped canopies. These canopies will help direct the flow of the air over the canopy. There are also ventilated canopies, and these will allow the air to pass through it. This is how these umbrellas do such a good job in resisting the wind. Now that you know what is a golf umbrella, you understand how important it is, especially in harsh weather conditions. There is no shortage of golf umbrellas in the market, but we recommend that you spend a little extra money and buy yourself only a high-quality golf umbrella. Those kinds of umbrellas will do an excellent job on the golf course and won’t require you to replace it every few months.